Subscription boxes are taking over the world. Pay a regular fee and you can have anything “curated” and delivered to your doorstep, from your nightly dinner to the clothes you wear to work. Typically, I don’t appreciate these subscription boxes because I like the hunting/gathering nature of shopping for myself. It connects me to my Neanderthal roots. I love going to the grocery store and fondling the fruit to find the right peach. I look forward to my regular trips to the Banana Republic outlet to pick out my own cardigan sweaters and skinny jeans. In theory, I should be all about these subscription boxes because I’m generally a lazy person and the idea of paying a small fee to have someone else pick out my food/clothing/books/outdoor gear should be right up my alley…and yet I still choose to go into a store and do the heavy lifting myself. Humans are mysterious creatures; go figure. But I’m also a journalist so occasionally, I have to step out of my comfort zone in the name of work. For example, I had the chance to try out a new cocktail subscription box from the NYC-based Liquor Lab, and it turns out, having professionals shop for me and send the goods straight to my door in a handy-dandy box is actually pretty damn cool. The Liquor Lab is a school of sorts—think of the cooking school model where you sign up for a class on pasta making or winter stews, except instead of cooking you’re being taught how to make cocktails by pro mixologists. The Lab is taking their expertise out of the classroom with their new subscription based Dollar Cocktail Club. For $12 a month, the Dollar Cocktail Club will send you a monthly box with (almost) everything you need to make a batch of cocktails. I say “almost,” because unlike many other cocktail subscription boxes, the Dollar Cocktail Club doesn’t send you any booze. The Dollar Cocktail Club has a handful of different cocktail boxes in their lineup right now, and you get all of the ingredients to make a particular cocktail, except the spirit. It sounds like a bummer at first, but each cocktail is designed to use a common base spirit (tequila, vodka, bourbon) that you probably already have in your house. It’s all of the ancillary ingredients that you’re typically lacking. 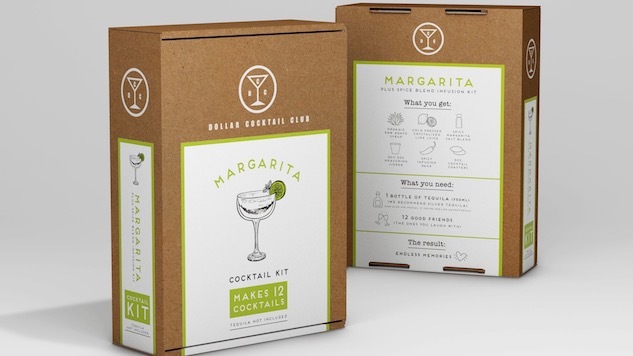 For example, they sent me the margarita box, which has lime juice, agave syrup, chili-lime salt and a “spice infuser.” I always have a bottle of tequila on hand (for medicinal purposes) but I never have chili salt or agave syrup. And the best part of this particular box, is that you get enough ingredients to make 12 cocktails. They even give you instructions for making a full pitcher of margaritas, or just a single cocktail. It’s like a cocktail party in a box. I followed the instructions and made a single cocktail using the ingredients in the box and a bottle of Suerte Blanco. The result was a solid margarita. It was a little sweeter than I typically like, but that’s easy to adjust on the next round. My only real complaint is that you’re not going to learn how to make any new cocktails with the Dollar Cocktail Club—at least not yet. So far, the lineup of cocktails that come to your door consists of well-tread territory (Old Fashioned, Martini, Margarita, Manhattan). One of the best features of these subscription boxes, whether it’s a meal prep box or a cocktail box, is learning something new. I look forward to seeing the variety of boxes grow as the Dollar Cocktail Club gets bigger. In the meantime, think of this subscription box as an excuse to throw an impromptu cocktail party every month.